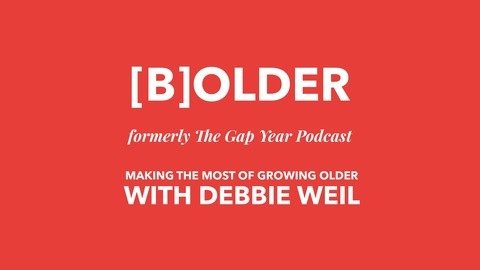 A podcast for those who believe you can take a timeout to reinvent your life, to find meaning, purpose and - yes, happiness! - especially when you are 50+ and figuring out what comes next. Yes, grown-ups can step out of their default life for a reset, for change and for bucket list adventures. But it's a bit more complicated than it is for students who only have to sling a backpack over their shoulders. Host Debbie Weil talks with guests about the money question, decision-making, the process of change and the pursuit of happiness. SPONSORS: Modern Elder Academy and Next For Me. 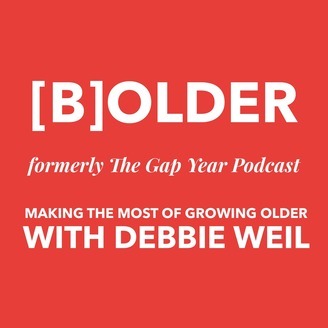 Debbie interviews Chip Conley, New York Times best-selling author, rebel hospitality entrepreneur and now a rock star of the mid-life transition movement. After selling Joie de Vivre Hospitality, the second largest boutique hotel brand in the U.S., Chip was invited at age 52 to work for AirBnB as an advisor to the young founders. He soon found himself to be both mentor and intern; the result was his newest book, "Wisdom @ Work, The Making of a Modern Elder." In January 2018, Chip founded Modern Elder Academy, the world's first mid-life wisdom school, in Baja California, Mexico. Together they talk about MEA's mission, which is to help mid-lifers mine their mastery, repurpose it and reset their mindset for the second half or third third of their life. They also talk about the experience of attending MEA where Debbie spent a week as a student and where she interviews Chip with waves pounding in the background. Note: the NYT article didn't get the story quite right. MEA is for more than tech workers; it's for those 35 - 75 seeking a next step.